Birds from this Spool pattern. The ten little birds. A commissioned project for a friend. I finished them up yesterday and they are flying to out today. She's going to use them to decorate her booth at the National Stationery Show in NYC next week. Thanks for sharing. 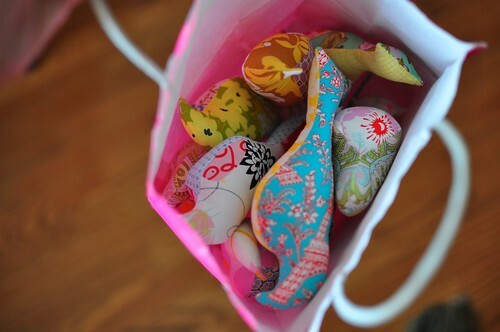 I can't wait to make these cute birdies! Now those are some adorable birds!!! Gorgeous fabric!! I love these birds!!! I already made a lot of them!! I love those birds. I tried making some and what I noticed that my 1st 2 birds turned out perfect but 3, 4 and 5 started looking more like parrots...they were fatter in the head, beak, everywhere. I have no idea where I went wrong. Oh they are so cute! You did a great job! I love all these cute little birds! thanks sew much for this post. I have already made one & hung it in my sewing room from the ceiling. I happened to look up & it scared me. I though I had a real bird in the house! - easiest gusset pattern I've seen. I intend to make a gathering of feathered friend to keep me company. Could you do a video post showing how you sew a row of your hexagons together? Thanks for all of your information, it is inspiring! I love these birdies! I made some about a year ago, stuffed them with dried lavender and left them all over the house! Yours look excellent! Uugh, all the projects just waiting to be done. Lucky you to have commissions!